For the past year-plus, tablet accessories have primarily focused on the Apple tablet. We’ve seen all manner of crazy cool (or odd) iPad gear — from arcade cabinets, theater seating built all around the tablet, scratch-ready DJ controllers and even gadget sleeves made from Bernie Madoff’s pants (seriously, it’s so bizarre). It has been a while now, and it’s clear that Android tablets are here to stay. So where the heck are all the Android tablet accessories? Comparatively, there has been a woefully minimal selection of Honeycomb gear, and that just ain’t right. That’s why I’m happy to see a large, reputable accessories maker recognize that there are other tablets on the market. I’m talking about Kensington and its KeyFolio Pro Universal folio and keyboard. A lot of companies would’ve stopped at just the iPad version, but Kensington went further by making an alternate model that’s optimized for Android Honeycomb tablets. I could’ve really used something like this during my time with the Moto Xoom. Maybe I’m in the minority, but I actually liked that tablet. And as a touch typer, having a decent keyboard in a compact, portable package would’ve made it even better. Well, I’ll let others debate the merits of giving any tablet a laptop-ish experience. But if you’re already sold on the concept, KeyFolio Pro looks like a pretty decent option. 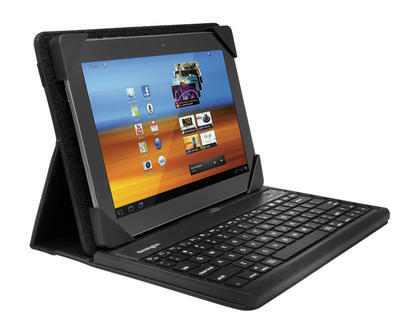 It offers a removable bluetooth keyboard in a case designed to fit 10-inchers like the Samsung Galaxy Tab, the Xoom or even a naked Asus Eeepad Transformer, if need be. It also features a stand that holds the device in seven different viewing angles (from 70 to 22 degrees), and battery life that lasts for a ginormous 100 active hours (60 days on standby), all on a single charge. I know the KeyFolio Pro isn’t the first Android-compatible keyboard on the market — not even the first one optimized for Honeycomb specifically — but at least it does deliver a decent alternative for users who don’t want a cheap product or a big, standalone keyboard to schlep around. And isn’t that the point? To have some choices? So great job, Kensington. Hopefully, others will follow your cue and start putting out some cool, creative items for this seriously underserved market. If you’re an Android tablet user, chime in: What real-life accessory do you just wish was available for your beloved gadget?